At the center you will find the latest fitness and body workout elements. That allow for multiple individuals to use the park at the same time. This is the park for today`s modern needs. Cooperate training increase motivation and comunication. A creativ bodyweight workout can be done anytime and anywhere. Having fun is the most important motivation. Whether you want to burn fat, build muscle, boost coordination or simple reshape your body. outdoor stainless steel fitness machines are build to enjoy healthy outdoor exercise. Outdoor fitness is particulary good for the body and soul, as it boosts fitnes levels and strengthens the immune system. Modern fitness equipment makes exercise fun and improves your health, well being and quality life. Le parkour or freerunning is the sport of fluid urban movements and can be practice everywhere. Find and use your own style and link skills together into a seamless, dynamic movement throw the urban cities. 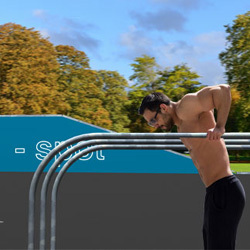 Start and improve your skills in a safe place at public parkour parks before.